Now renting Canoes, Kayaks, Tubes & Bikes. Conveniently located South of Menomonie on Hwy 25 1 mile then West on County Road D 1 mile just before the bridge over the Red Cedar River. 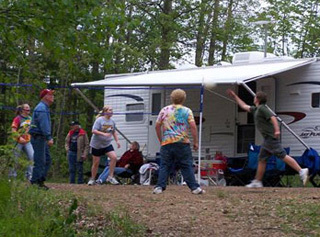 The campground has wooded and open site areas with full hook up, electric & water, rustic & seasonal sites available. Call 715-235-CAMP (2267) for reservations & availability. We also have a new building with restrooms, showers, laundry, office & game room. There is a dump station on site.